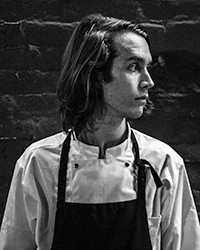 Cooking on Nature's Schedule: "There aren't just four seasons," says Berselius. "There are 52 seasons. Every week, things change. Every day, things change, actually. So you could say there are 365 seasons. That's the way I approach it." On His Menu's Already Infamous Dried Pig's Blood Cracker: "I really love it, because I grew up eating blood in various forms. They serve blood pudding at school lunches in Sweden—it's something that I remember."